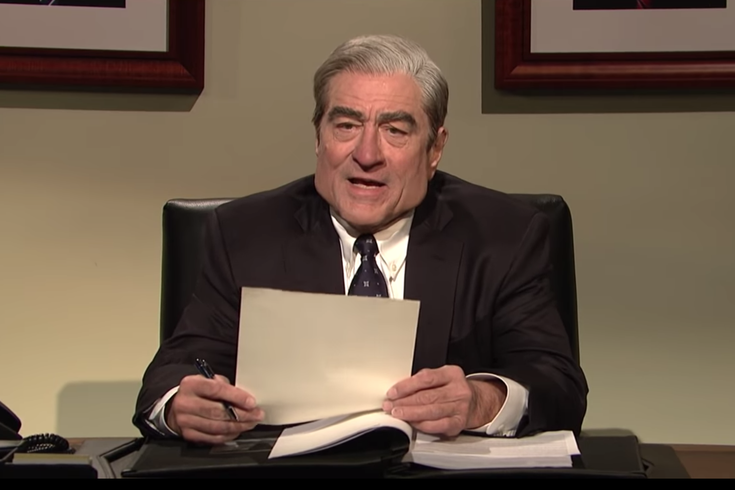 De Niro reprised his role as Robert Mueller to open the March 20 episode of "Saturday Night Live"
Robert De Niro returned to "Saturday Night Live" for the cold open during the March 30 episode to play Robert Mueller in the wake of the Mueller Report release this week. After a short break, "Saturday Night Live" is back with another political cold open for the books. Robert De Niro came back to set to play special counsel Robert Mueller, who last week announced he had finished his two-year long investigation into the president's dealings with Russia during the 2016 election. Last Sunday, Attorney General William Barr released a letter detailing the key findings of the report. So, the cold open played with not just Mueller, but also Barr (Aidy Bryant) and President Trump (Alec Baldwin), who went on a Twitter rampage after the report's release defending his innocence. "On the charge of obstruction of justice, we have not drawn a definitive conclusion," Mueller said, reading from his report. "But I have, and my conclusion is that Trump is clean as a whistle," Barr said, typing the four-page letter that was released to the public. "Free at last, free at last!" Trump said, while tweeting. The trio riffed on their opposing reactions to the Mueller Report — Barr and President Trump, notably, were preemptively expunging the president. "In conclusion, it is my hope this report will be made public, with a few redactions," Mueller said. "We're gonna black out everything except 'no' and 'collusion,'" Trump said.